I do like it when readers suggest posts. You feel you’re fulfilling a need. Two weeks ago, on Five Tips on Bespoke Suits, a reader requested a similar post on bespoke shoes, so here it is. I know it’s the same as the first suits tip, but if anything it’s even more true with shoes. You are likely to have more suits than shoes; shoes have to be more versatile. The beauty of bespoke shoe is in the lines, of waist and heel, rather than funky colours. And the availability of made-to-order services makes it easier to vary a shoe you like than a suit. This is a rule I’ve followed far better with shoes than suits – my five bespoke pairs so far have been black and brown oxfords, plus one pair of slip-ons. Having emphasised conservatism, you should play with the details of a bespoke shoe. Discuss the welt; look at the heel shape; suggest an alternative line for the seam. Shoemakers are more artistic than tailors, and will usually welcome such discussions. From Berluti to Corthay to Aubercy, many shoemakers sketch and paint their shoe designs where tailors rarely do. The most important thing to the style of the shoe is the toe shape – everything from the joints forwards. Unlike a suit, you can probably try this style in advance, in your size. Just try a few RTW shoes and get an idea of the shape you like. Some makers – such as Norman Vilalta – develop a new toe shape for every bespoke customer. But most stick to their standards. With Cleverley, Corthay and Gaziano & Gilring expanding their RTW lines, it’s even easier. Some shoemakers make the fitting in waste leather, and then cut it apart while you’re wearing it to see where the foot sits inside. They may tell you it’s impossible to get a good fit without it. That hasn’t been my experience. It’s about what works for the shoemaker – just like tailors, some of whom have made a better-fitting suit in two fittings than others did in five. Do feed back as much information as you can at that fitting though, and take time to wear the shoe, walk around and warm it up, in order to provide as much information as possible. Boots are beautiful things to have made bespoke. The curve up and around the ankle can be as pleasing as the waist of the sole. They can also be a nice bridge between casual and formal wear – a laced boot can work with both jeans and worsted where a shoe would not. I haven’t had any made so far because they can be too hot for the office; but my next pair will be Chelsea boots from Tim Little: for walking and travelling, rather than working. 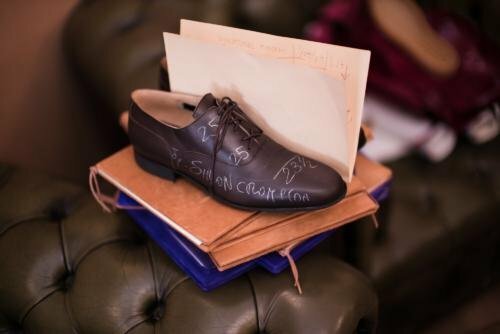 You can follow the discussion on Five tips on bespoke shoes by entering your email address in the box below. You will then receive an email every time a new comment is added. These will also contain a link to a page where you can stop the alerts, and remove all of your related data from the site. To suggest anything? Thinning perhaps a desert boot with a crepe sole? A crepe sole would be comfortable, but I would recommend trying Goodyear shoes again, perhaps with a rubber sole. – Second is not looking after the shoe. Shoe trees stop hard creases forming. Leather cream stops them drying out. – Third is impatience. Good leather shoes become very comfortable with age, but should only be worn every other day, and for 3/4 hours a day for the first few times. Less structured shoes always feel more comfortable to start with, but structure takes over after a few weeks, and then runs ahead of the rest for years to come. You said about boots they work with jeans and worsted whereas a shoe won’t.?. I myself wear most oxfords (not black) with jeans to no issue. And have seen pictures of you doing the same. Or do you just mean certain types of shoe. Certain types of shoe certainly will. But more boots will. can black shoes work with black jeans? black plain monkstraps with black jeans? Not really no. Black shoes are simply too formal. Ha, ha, ha! If Tim Little designs your boots, your conservative bent expressed in your Meditation I will be endangered! An unrelated question: do you know anything about the coat makers Graham Browne uses? I understand they are in Essex and moving into joint premises these days. Might be an interesting read a post about how things are done at thia price level. Maybe an idea for a future article? Yes, I’ve met all of Graham Browne’s coatmakers over the years, who work from home mostly. But I understand they are moving into a single premises to help with quality control. Nice idea for a piece. presently I am in the process of having shoes made to measure by a Vienna shoemaker. He – like others before him – told me that my big toe is very straight and so the last also needs to be straight at the inside in order not to bend the toes. This leads to a quite ugly last. I have checked this with other people and have observed that most people have quite straight big toes. The shoemaker says yes, this is the case, and they all should be wearing shoes which are straight on the inside. But fact is almost nobody does this. Do you think it is a problem in the long run to wear shoes which bend the big toes slightly outward in order to achieve a beautiful form? You certainly don’t want to be putting pressure on your toes with a shoe, or create pain. It may be worth putting up with in the short term, but you’ll end up not wearing them and the investment will be undermined. It’s hard to know whether what the maker is describing is a real problem or not, or whether you’re unusual or not, without seeing things first-hand. But perhaps ask him to make a more elegant last for the fitting and you can test whether it is putting pressure on the two. If it is, he can just add some leather to the last at that point to compensate. thank you very much for this tip. Hi Simon. Do you know if shoemakers (like tailors) do accommodate clients for the initial measurements and trail fitting within a short period of time — perhaps a week and then subsequently mail the shoes, if said client is travelling to the shoemaker during his vacation? Thanks! I intend to take my first step, pun intended, into bespoke shoes as I find RTW difficult to find for my size. Can you recommend any bespoke shoemakers, particularly from the UK?